A Palindrome number is a number, which when reversed in order of digits, produces the same number a the original one. 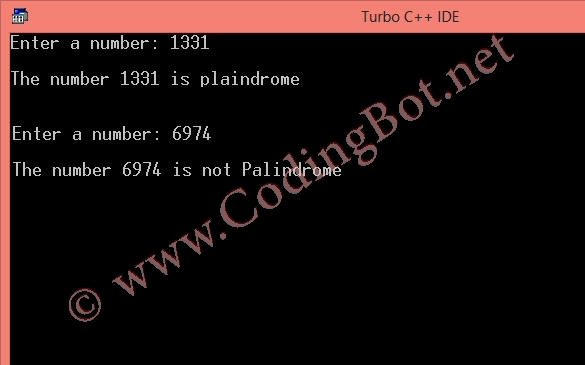 Some examples of Palindrome numbers are: 11, 121, 1331. 14641, 15101051, 989, 5225 etc. The C program for the same is very simple. First we will reverse the original number and then check it with the original number. If found same, number is palindrome, otherwise not. Input number from user, 'num'. Apply Logic on 'num', produce reversed number 'rev'. If num == rev, print 'num' is Palindrome. Otherwise print 'num' is not Palindrome.